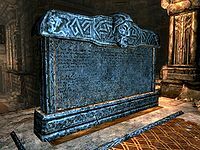 Calcelmo's Stone is an artifact bearing inscriptions in both the Dwemer and Falmer alphabets. The Falmer inscription may be translated almost fully using our knowledge of the Ayleid language, and the result is relatively close to the official translation given by Kurt Kuhlmann. Chillrend is an artifact of unknown origins. It takes the form of a glass shortsword, although, unlike regular malachite, it is blue instead of green. Like other glass weapons, its hilt was fashioned from rare metals and moonstone. Its enchantment varies in strength and properties, but it always causes magical frost damage to the opponent. Other known effects include causing a weakness to frost, or temporary paralysis. The sword's first known owner was Valus Odiil, an Imperial adventurer who wandered Tamriel (or at least Hammerfell). Valus eventually settled down in Cyrodiil, and bought a farm outside the walls of Chorrol. However, his farm was continuously raided by goblins from the Great Forest, and the town guard refused to help. In 3E 433, unable to fight in his old age, he asked the Champion of Cyrodiil to aid his two sons in killing the goblins. After the battle, Valus passed on Chillrend to the Champion for keeping his sons safe, saying that he was going to spend the rest of his days in peace. 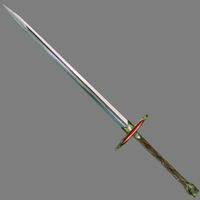 The sword later came into the possession of Mercer Frey, the Guildmaster of the Skyrim branch of the Thieves Guild. Mercer was a renowned thief who secretly possessed the Skeleton Key, which gifted him with great luck. By 4E 201, Mercer had stowed the sword in the secret basement of his Riften home. 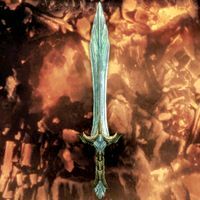 The sword was taken by the Last Dragonborn after it was discovered that Mercer had betrayed the Guild. Chrysamere, also known as the Paladin's Blade and Sword of Heroes, is an ancient claymore artifact with offensive capabilities only surpassed by its defenses. 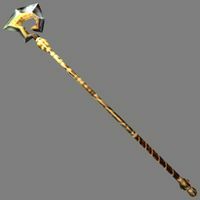 It has magical properties which, unlike most weapons, are defensive in nature; it lends the wielder health, boosts their resistance to fire, and reflects some damage from spells. 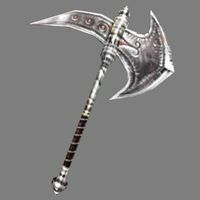 The Cleaver of St. Felms the Bold (or St. Felms' Cleaver) is a one-handed axe which belonged to the eponymous saint of the Dunmer. In or before 3E 427, a Buoyant Armiger carried it into battle against ash vampires on the northeastern slopes of Red Mountain and died. The Nerevarine recovered the holy relic and then received it as a reward for various services to the Tribunal Temple. The Crosier of St. Llothis is a staff sacred to the Dunmer as a holy relic. The undefeated spirit of St. Llothis the Pious is said to be contained within it. However, the staff's fitness for combat is questionable, as the staff's enchantments actually have various adverse effects on the wielder. In or just before 3E 427, the Captain of the Buoyant Armigers took the staff into battle against Dagoth Ur's forces on Red Mountain. To protect his retreating subordinates, the Captain mounted a last stand near Dagoth Ur's citadel, and the staff was lost. The Nerevarine soon recovered the relic, and then received it as a reward for various services to the Tribunal Temple. The Crown of Freydis, originally the Crown of Verity, was a magical artifact created to test the worthiness of potential rulers of Skyrim. It is the second royal crown of Skyrim, replacing the Jagged Crown when it was lost to time during the War of Succession. However, in time it faded from use, and it has not been seen since the Second Era. 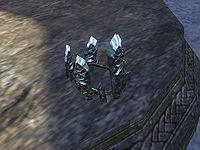 The Ayleid Crown of Nenalata is an ancient Ayleid artifact. Its appearance varies, sometimes appearing as a lightweight Moonstone helm, sometimes as a simple crown. It can be distinguished from other Ayleid crowns by a royal glyph emblazoned upon it. Superficial enchantments grant the wearer spell reflection and increased skill at Alteration and Conjuration magic, although the true potential of the crown is seemingly much greater. It is an immensely valuable treasure. 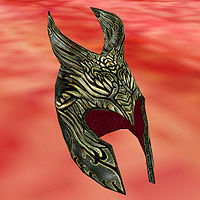 The crown was traditionally worn by the king of the Ayleid city-state of Nenalata, a Daedraphile settlement at the mouth of the Silverfish River in Cyrodiil. The city-state is famed for being the longest-lasting Ayleid outpost within Cyrodiil's borders, due largely to their allegiance to the Alessian Empire. The crown's final bearer was Laloriaran Dynar, the so-called Last King of the Ayleids, who inherited it from his father some time before 1E 331. It had seemingly left his possession by the time he was imprisoned in Coldharbour in 1E 484. By 2E 582, the crown had come into the possession of the Aldmeri Dominion. However, the crown was stolen by a Bosmer man who was apparently practicing the Rite of Theft. He traded it back to the Dominion for a song, confounding the Altmer. 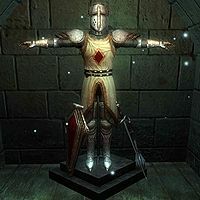 The crown was brought to a secure vault in the newly-built city of Marbruk in Greenshade for safekeeping, alongside various other Ayleid artifacts. In 3E 433, the crown was purchased by an Imperial scholar of the Ayleids named Herminia Cinna. An Altmer collector named Umbacano desired to buy the crown from her, planning to use it in the throne room of Nenalata to transform himself into the King of Nenalata and lead a rebirth of Ayleid civilization. Rightly fearing Umbacano's ulterior motives, Cinna refused to sell, instead hoping to trick him into accepting the Crown of Lindai. Umbacano sent the Champion of Cyrodiil to steal the crown from Cinna's house in the Imperial City, although it is unknown if the Champion went through with this or recovered the other crown instead. Regardless, Umbacano was killed later that year during an expedition to Nenalata. This page was last modified on 22 March 2019, at 01:31.